Hardwood adds instant luxury and value to every space it graces, with dramatic results. With its uncanny ability to transform, hardwood flooring can make your smaller rooms appear more spacious, adding elegance and distinction. With proper placement and care, your new hardwood floor can stay intact for generations. At Floor to Ceiling Carpet One Floor & Home, we carry a variety of both solid and engineered hardwood, with options to transform all types of spaces. Our seasoned team of flooring experts can help you find the perfect hardwood to fit your space, functional needs, and style. If you’re considering a hardwood floor for your home or business, here are a few things to keep in mind before you make your final decision. Both engineered and solid hardwood flooring are available in many different wood species. The hardwood species you select will help express your personal style, whether traditional or contemporary or, like most of us, somewhere in between. Solid hardwood is hardwood flooring at its most traditional, and is made from solid wood. Simple and enduring, your solid hardwood floor can evolve right along with you since it can be refinished repeatedly. Solid hardwood has a long lifespan and is offered in a wide variety of wood species and plank sizes. Engineered hardwood is the modern answer to some of the common dilemmas of solid hardwood. It looks virtually identical to its more traditional cousin, but is actually crafted in dense layers, for flooring with added durability. From its protective top coat to its moisture resisting center, engineered hardwood works well in spaces that once were inhospitable to hardwood, including rooms below grade. At Floor to Ceiling Carpet One Floor & Home, we’re proud to offer you all of the latest in solid and engineered hardwood flooring products. Our goal is the same as yours: to find flooring that will meet all of your style and functional needs, and will stand its own for many years to come. 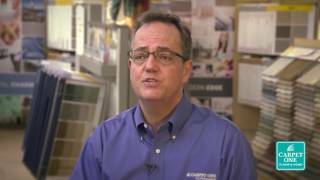 As part of Carpet One Floor & Home, which is the continent’s largest cooperative of independent flooring stores, we boast the buying power of nearly a thousand other vendors, competitive prices, and the personalized services only a small business can provide. Visit us today at 1516 I-94 Business Loop East in Dickinson, ND, and explore our hardwood flooring possibilities. Our hardwood experts will help you choose the best hardwood flooring option for your home setting. Hardwood flooring is durable, by nature, but with a little extra TLC, your floor will stay newer for a lot longer. Really, all it takes is a few small precautions, and an occasional cleaning.